Texas Bombay Rescue View other Bombays for adoption. 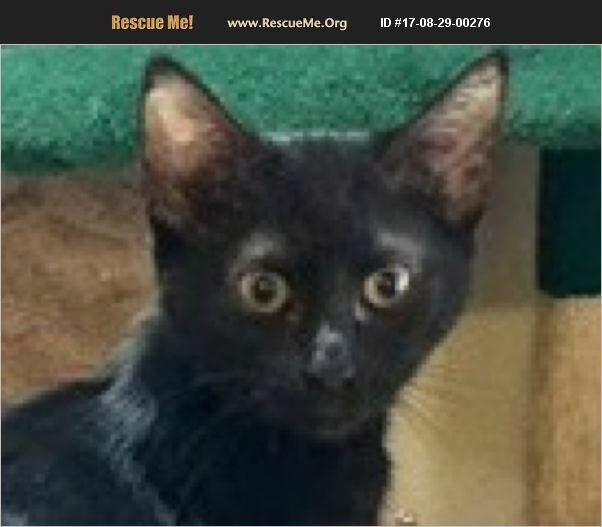 My name is Allie, and I am an exquisitely beautiful and petite black DSH/ Bombay mix gal who was born in April 2017. I have the Bombay mix's sleek, shiny black-patent-leather coat and mesmerizing round copper-penny eyes. But I'm not just eye candy! I am a loving sweetheart to the 10th degree. Actually, that's not surprising because Bombay mixes are sometimes called Velcro kitties because they are so sociable and like people so much. Plus I just love, love, love to play with catnip mice, balls with bells, and my siblings. Anna, Alfie, Amos, and I were born to a feral mom, and the shelter released us to our future Buster's Friends' foster mom after we were weaned. I am extremely well socialized and very sweet. I get along with other kitties, small dogs - everyone! I would be perfect for a family with kids too. I'm available individually, but if you are in the market for a pair of siblings, please consider adopting either Anna, Alfie, or Amos along with me. Two is more fun than one, and we can always keep each other company while you're at work or on vacation. No matter what, don't waste any time in making arrangements to meet me.I know you won't be able to resist me when I gaze into your eyes with my big gold saucer eyes! Please don't be superstitious of black cats! You know, Groucho Marx once said, 'A black cat crossing your path signifies that the animal is going somewhere.' Buster's Friends makes a concerted effort to rescue black cats and kittens from shelters because they are five times more likely to be euthanized than any other color of cat. However, many people who have had a black or Bombay mix cat before end up adopting another one because they seem to have such wonderful personalities and are emotionally stable and well balanced. To find out more about Bombay mixes, watch the 2-3 minute You Tube video that appeared on Animal Planet by Googling 'Cats 101 Bombay.' Allie is updated on shots, spayed, dewormed, microchipped, FIV/ FeLV negative, and ready for her indoor-only home. No de-clawing permitted. Her adoption fee is $125 for kittens 9 months old and younger, cash or check payable to Buster's Friends. Please click the contact button if you are interested in Allie, and we can let you know exactly where you can meet her. To make the process more efficient, download the adoption application at http://www.bustersfriends.org/catadoptionapplication.shtml. First save and then open it; then you can print it and fill it out.